1* GOOD VIEW: Glass front cover guarantee good view. 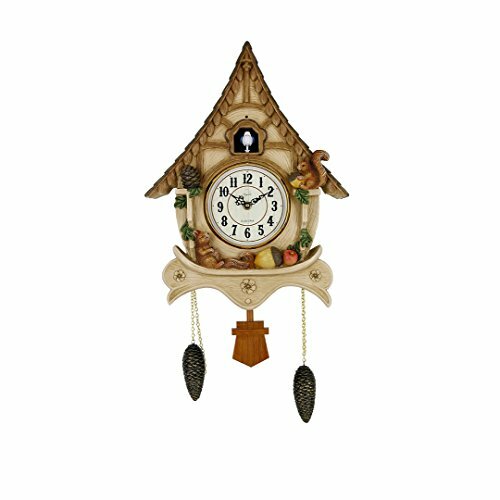 4*Cuckoo clock is not only the timekeeping clock but also the leisure method to relax with sweet cuckoo sound. Your home will be full of love with such top grade crafts. 5*Exquisite Craftmanship The Finest Materials and artisanal workmanship to ensure that each clock is perfect. 6.Professionaler Customer: Although there are time differences, our customer service staff will answer your every question within 24 hours, and offer you a satisfactory solution. 1*PERFECT PACKAGE: Each product packed in a bubble bag, then put into a thicker box. 2*EASY INSTALLATION: Back Hook makes easy installation. 3*There are slight difference between the picture and the real item caused by light brightness. 4*Because the batteries is limited by interenational transport , the battery is no contain, please pay attention. 1*Check the package to guarantee the clock shipping in a good condition. 2*Strictly inspection to every clock before shipping. 3*Quality assurance, we promise to replace the defective product within 3 months. 1*Smart light-control Cuckoo hourly chimes. 2*Sound of Natural Cuckoo On Every Hour. Bring your home to life with the sweet sound of the cuckoo bird. 3*Notice:It takes 1 AA and 2 UM-2(R14 or C) batteries that are not included in the package box. 4*Cuckoo clock automatically strikes the time in the daylight or the light reaches the defaut value (6 coco every hour). It won't strike the time at night or the dark light( it's regarded as rest time, not defective). 5*A perfect size wall clock you will love to have in your living room. It easily complements the other furniture in your home.